All other formats are converted versions of the original. This recording is made using only one microphone; Josephson C700S. The Feenbrothers are an institution in the European music scene. They started out as a family band but were soon in great demand individually, called upon by likes of the Royal Concertgebouw Orchestra, The Metropole Orchestra, Jazz Orchestra of the Concertgebouw, Toots Thielemans, Han Bennink, Caro Emerald... the list would go on for several pages, should I name all the artists that have benefitted from their superb musicianship. They each have their own taste in music, and they are not necessarily in agreement as to what they think of as great music, but one exception is the music of Dave Brubeck. 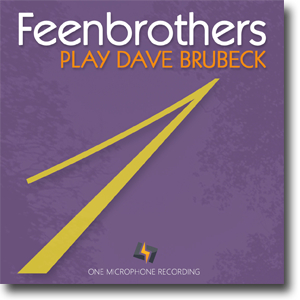 So when looking for a theme to bring the Feenbrothers back together for a small tour, Brubeck’s music was an obvious choice. This is our second One Mic Recording. It was not planned as such. The Brubeck concert was planned long before we had even thought about recording only using the Josephson C700S. But what happened is kind of a follow up to the story behind our first one mic recording; Carmen Gomes Inc. 'Don’t you Cry'. Paul and Mark van der Feen, had heard the first trial recording we did with the Josephson C700S and really liked the sound, so when the Feenbrothers arrived in the studio for the sound check, they insisted that they wanted to record that way too. Frans was very sceptical as he thought the Brubeck repertoire, with it’s great dynamic variation between the tunes, did not lend itself to such a minimalistic approach. But Paul said not to worry; "Please, find the sweet spot and we’ll play in balance." It took about three hours to complete the sound stage by carefully moving each instrument closer or further away as well as left and right in relationship to the microphone. The four Feenbrothers are very different personalities. Where the brotherhood truly shows is when they start playing; anything and everything seems possible. A good example is in the piano solo on 'It’s a Raggy Waltz' where Mark’s mobile phone, used for reading the setlist, falls into the piano and for a full bar creates a distortion effect as it vibrates on the piano strings. Somehow the flow of the solo is not interrupted. The incident is merely a bump in the road, that sends Mark down a slightly different path, closely followed by Clemens and Matthijs. And in 'Gone With the Wind' Paul starts off acapella, following a sudden inspiration, forcing his brothers to create a completely different arrangement of the song on the spot. Such pure joy of playing is infectious, listen to 'Unsquare Dance' where the audience joins in clapping along in 7/4 meter! On this recording the audience is rather more present than on our other live recordings from Studio 2. We prefer not to have more than 80 people present in the studio. That number leaves us room to move around, change a cable or a microphone if needed, reposition the musicians if needed and so forth. But as fate would have it, the computer system keeping count of the tickets sold for the concert, had some kind of a breakdown so instead of 80 tickets, 110 were sold. Extra seats were brought in, so the audience ended up being very close to the band, creating a very lively atmosphere. And as Frans noticed during the extended applause following the end of the concert; "Look at the phase meter, it's practically straight in the middle, a phase coherent applaus! ".